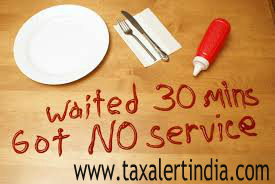 Ministry of consumer affairs, Food and public distribution department issued a notification as restuarant billing 'Service Charges' in addition of taxes is optional. Full notification is as under. A number of complaints from consumers have been received that hotels and restaurants are following the practice of charging 'service charge' in the range of 5­20%, in lieu of tips, which a consumer is forced to pay irrespective of the kind of service provided to him. The Consumer Protection Act, 1986 provides that a trade practice which, for the purpose of promoting the sale, use or the supply of any goods or for the provision of any service, adopts any unfair method or deceptive practice, is to be treated as an unfair trade practice and that a consumer can make a complaint to the appropriate consumer forum established under the Act against such unfair trade practices. In this context, the department of Consumer Affairs, Central Government has called for clarification from the Hotel Association of India, which have replied that the service charge is completely discretionary and should a customer be dissatisfied with the dining experience he/she can have it waived off. Therefore, it is deemed to be accepted voluntarily. Correction: You can refuse Service Charges in restaurants. NOT Service Tax! Please review your article.